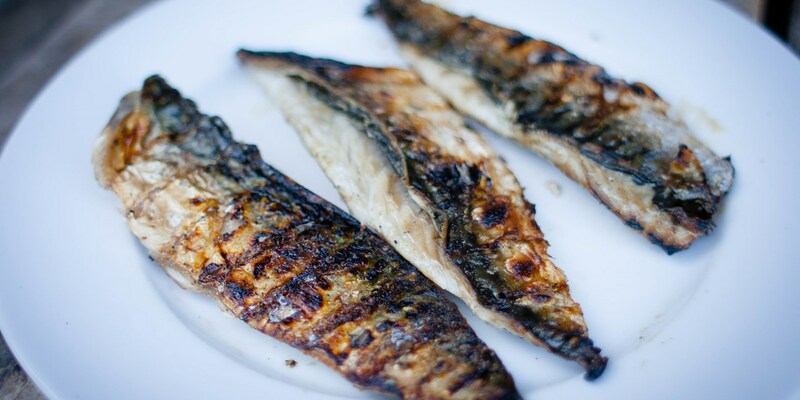 Mackerel are great for barbecuing - they have a tasty, robust flavour which stands up well to the smokiness of a barbecue. And it's easy too - cooking a fish whole on the bone helps to slow down the cooking time, so you are less likely to overcook the fish. That said, keep an eye on the fish as it cooks, overcooked mackerel will have dry flesh and diminish the joys to be had from this succulent, oily fish. To check that a whole mackerel is cooked through, the eyes should turn a milky white colour, the skin will be able to be removed easily and the flesh should be flaky and moist. If adding the mackerel directly to the barbecue, make sure the grill is clean and the fish is well oiled - this will help to prevent it sticking. To counteract the oily, smoky flavour of the mackerel, try serving with sweet, earthy and acidic flavours - Bruno Loubet’s simple beetroot salad, for example, makes a winning accompaniment or try Robert Thompson's Grilled mackerel which he serves with a tangy tomato ceviche. Try Paul Ainsworth's Barbecued mackerel with celeriac mayonnaise for a simple summer starter or Monica Shaw's Grilled mackerel with beetroot and new potatoes.